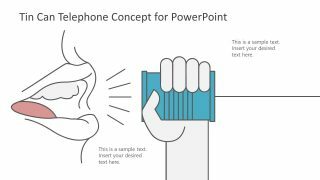 The 4 Lead Generation Funnel Styles Template for PowerPoint is a sales and marketing presentation slide. 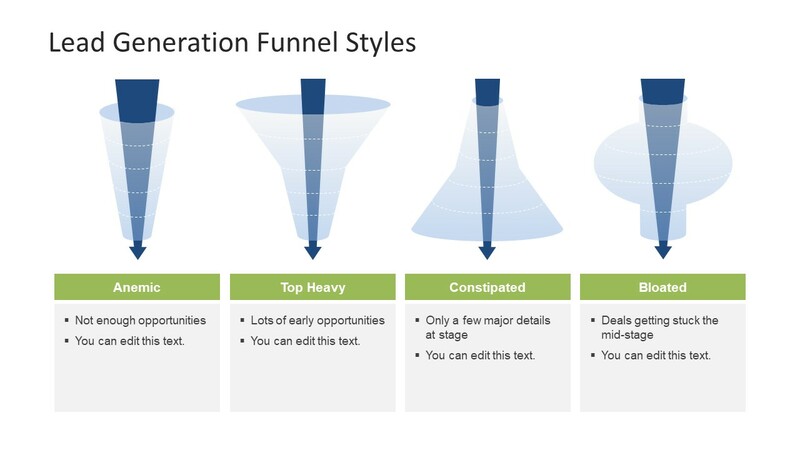 The PowerPoint shows four type of lead generation funnels to present several topics like, sales pipeline, marketing. Similarly, the procedure and analysis of company’s recruitment and its policies using this layer diagram design. The 1-slide template includes the set of variant layer filters and stage-wise filters. The organizations today use the such graphics to present business growth and transparency in the model to attain trustworthy stakeholders. These funnel charts can prove helpful in demonstrating the automation of filtering processes. Also, the illustration of funnel diagram shows the diversity yet a straightforward style to present various lead generation models. 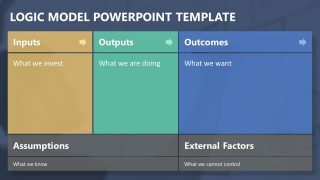 The 4 Lead Generation Funnel Styles Template for PowerPoint presents layer diagram designs for 5-step models. These diagrams include a narrow pipeline, two styles of wide open input side as top down and bottom up both. Moreover, the bloated diagram has narrow input and output for the lead generation pipeline. Each of these funnel diagram represents different meaning. Here, the slide template has placeholders with small description of all four lead generation pipelines. For example, Anemic, a thin funnel describes lack of opportunity. Whereas, the top heavy demonstrates lots of opportunities in the beginning and constipated funnel shows fewer details at the start. Similarly, the template has bloat diagram means the opportunities which are no longer viable in a pipeline. 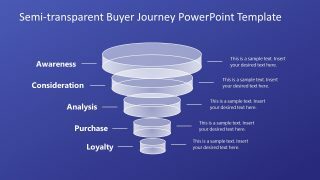 The editable template of 4 Lead Generation Funnel styles is a tool for presenting framework structure of business in PowerPoint. The users can select their desire design of funnel chart to present their business processes. Also, the 5 levels of diagram are change able by simply adding or deleting the dotted lines of the stages. 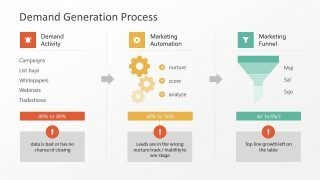 The lead generation funnel styles are ideal for telecommunication and online marketing businesses.